This is the story of a long-gone era. In the country of India, nearly five thousand years back, lived a boy named Eklavya, the son of a tribal chief in the forests of the kingdom- Hastinapura. Eklavya was a brave, handsome boy. He was loved by all. But he was not happy. His father saw that something troubled Eklavya. More than once he found his son lost deep in thought when other boys enjoyed the pleasures of hunting and playing. One day the father asked his son, "Why are you so unhappy, Eklavya? Why don’t you join your friends? Why are you not interested in hunting?". "Father, I want to be an archer" replied Eklavya, "I want to become a disciple of the great Dronacharya, the great tutor of Archery in Hastinapura. His Gurukul is a magical place where ordinary boys are turned into mighty warriors." Eklavya saw his father was silent. He continued, " Father, I know that we belong to the hunting tribe, but I want to be a warrior, father, not a mere hunter. So please allow me to leave home and become the disciple of Dronacharya." Eklavya's father was troubled, for he knew that his son’s ambition was not an easy one. But the chief was a loving father and he did not want to refuse his only son’s wish. So the kind man gave his blessings and sent his son on his way to Drona’s Gurukul. Eklavya set on his way. Soon he reached the part of the forest where Drona taught the princes of Hastinapur. In those days, there was no such system as a school, college, university or hostel. The only place where one could get some education was a " Gurukul". A Gurukul (Guru refers to "teacher" or "master"; Kul refers to his domain, from the Sanskrit word kula, meaning extended family.) is a type of ancient Hindu school in India that is residential in nature with the shishyas or students and the guru or teacher living in proximity, many a time within the same house. The Gurukul is the place where the students resided together as equals, irrespective of their social standing. The students learned from the guru and also helped the guru in his day-to-day life, including the carrying out of mundane chores such as washing clothes, cooking, etc. The education imparted thus, was a wholesome one. Having said this much, let us now return to Eklavya. When the boy reached Dronacharya’s Gurukul, he saw that it consisted of a group of huts, surrounded by trees and an archery yard. The disciples were practicing to shoot arrows with their bows and arrows in the yard. It was an engaging sight. But Eklavya’s eyes searched Drona. Where was he? Will he be able to see the man? Without Drona, all his purpose of coming here would be meaningless. But all his worries soon subsided. He didn’t have to wait for long. There was the man standing near a tree busy instructing a boy, who was none else than the third Pandava prince Arjuna, as Eklavya came to know later. Though Eklavya had never seen Drona before, he put his guess at work. He went near Drona and bowed. The sage was surprised to see a strange boy addressing him. "Who are you?" he asked. "Dronacharya, I am Eklavya, son of the Tribal Chief in the western part of the forests of Hastinapura." Eklavya replied. "Please accept me as your disciple and teach me the wonderful art of Archery." Drona sighed. "Eklavya..." said he,"... if you are a tribal hunter, you must be a Shudra, the lowest social community according to the Vedic Caste System. I am a Brahmin, the highest caste in the kingdom. I cannot teach a Shudra boy." "And he's also a Royal teacher," interrupted Prince Arjuna. "Our Guru has been appointed by the King to train us, the princes and the highborn. How dare you come inside the Gurukul and seek him? Leave! NOW!" he spat out, looking enraged that Eklavya had disturbed his practice. Eklavya was stunned at Arjuna's behaviour. He himself was the son of the chief of his clan, but he never insulted anyone below him in such a way. He looked at Drona for some kind of support, but the sage remained silent. The message was loud and clear. Dronacharya also wanted him to leave. He refused to teach him. The innocent tribal boy was deeply hurt by Drona's refusal to teach him. "It's not fair!" he thought miserably. "God has given knowledge to all, but man alone differentiates his kind." He left the place with a broken heart and a bitter taste in his mouth. But it could not shatter his ambition to learn Archery. He was still as determined to learn Archery. "I may be a Shudra but does it make any difference?" thought he. " I am as strong and zealous as Drona's princes and disciples. If I practice the art everyday, I can surely become an archer." Eklavya reached his own forests and took some mud from a nearby river. He made a statue of Dronacharya and selected a secluded clearing in the forests to place it. 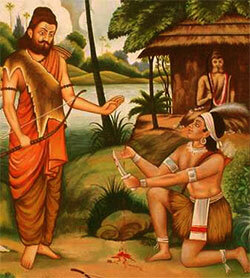 Eklavya did this because he faithfully believed that if he practiced before his Guru, he would become an able archer. Thus, though his Guru shunned him, he still held him in high esteem and thought of him as his Guru. Day after day, he took his bow and arrow, worshipped the statue of Drona and started practice. In time faith, courage and perseverance transformed Eklavya the mere tribal hunter into Eklavya the extraordinary archer. Eklavya became an archer of exceptional prowess, superior even to Drona's best pupil, Arjuna. One day while Eklavya is practicing, he hears a dog barking. At first the boy ignored the dog, but continuous disturbance in his practice angered him. He stopped his practice and went towards the place where the dog was barking. Before the dog could shut up or get out of the way, Eklavya fired seven arrows in rapid succession to fill the dog's mouth without injuring it. As a result it roamed the forests with its mouth opened. But Eklavya was not alone in his practice. He was unaware of the fact that just some distance away, the Pandava princes were also present in that area of the forest. As fate would have it, that day, they had come with their teacher, Drona, who was instructing them about some finer points of archery by making them learn in the real-life condition of the open jungle. As they were busy practicing, they suddenly chanced upon the "stuffed" dog, and wonder who could have pulled off such a feat of archery. Drona was amazed too." Such an excellent aim can only come from a mighty archer." he exclaimed. He told the Pandavas that if somebody was such a good archer then he surely needed to be met. The practice was stopped and together they began searching the forest for the one behind such amazing feat. They found a dark-skinned man dressed all in black, his body besmeared with filth and his hair in matted locks. It was Eklavya. Dronacharya went up to him. "Your aim is truly remarkable!" Drona praised Eklavya, and asked "From whom did you learn Archery?" Eklavya was thrilled to hear Drona's praises. How surprised he will be if he told Drona that he, in fact was his Guru! "From you my Master. You are my Guru," Eklavya replied humbly. "Your Guru? How can I be your Guru? I have never seen you before!" Drona exclaimed in surprise. But all of a sudden he remembered something. He remembered about an eager boy who had visited his Gurukul several months ago. " Now I remember," said he. "Are you not the same hunter boy whom I refused admission in my Gurukul some months back?" "Yes, Dronacharya", replied the boy. "After I left your Gurukul, I came home and made a statue like you and worshipped it every day. I practiced before your image. You refused to teach me, but your statue did not. Thanks to it, I have become a good archer." Hearing this, Arjuna became angry. "But you promised me that you'd make me the best archer in the world!" he accused Drona. "Now how can that be? Now a common hunter has become better than me!" The other princes remembered their master frequently praising Arjuna that he had immense talent and will be the greatest archer in the kingdom. They waited with bated breath. What will their teacher do now? Unable to answer Arjuna's question, Drona remained silent. The sage too was upset that his promise to Prince Arjuna was not going to be fulfilled. He was also angry with Eklavya for disobeying him. So the sage planned to punish Eklavya. "Where is your guru dakhsina? You have to give me a gift for your training," the sage demanded. He had finally found a way to make Eklavya suffer for his disobedience. Eklavya was overjoyed. A guru dakshina was the voluntary fee or gift offered by a disciple to his guru at the end of his training. The guru-shishya parampara, i.e. the teacher-student tradition, was a hallowed tradition in Hinduism. At the end of a shishya's study, the guru asks for a "guru dakshina," since a guru does not take fees. A guru dakshina is the final offering from a student to the guru before leaving the ashram. The teacher may ask for something or nothing at all. "Dronacharya, I'll be the happiest person on earth to serve you. Ask me anything and I will offer it to you as my guru dhakshina "he said. "I might ask something you don't like to give me. What if you refuse the dhakshina I want?" Drona asked cunningly. Eklavya was shocked. It was considered a grave insult and a great sin if a guru's dakshina was refused. "No! How can I, teacher? I am not that ungrateful. I'll never refuse anything you ask, Dronacharya," promised the unsuspecting boy. Drona did not wait anymore. "Eklavya, I seek to have your right-hand thumb as my guru dhakshina" he declared. Silence befell on everyone. Everyone was shocked, even Arjuna. He looked at his teacher in horror and disbelief. How could their teacher make such a cruel demand? That too, from a mere boy? For a moment Eklavya stood silent. Without his thumb he could never shoot arrows again. But the teacher must be satisfied. "Ok Gurudev, as you wish." said he. Then, without the slightest hesitation, Eklavya drew out his knife and cut his thumb! The princes gasped at Eklavya's act of bravery. But the tribal boy betrayed no signs of pain, and held out his severed thumb to Dronacharya. "Here is my guru dakshina, Drona", Ekalavya said. "I am happy that you have made me your disciple, even if I'm a mere Shudra hunter." The sage was humbled. He blessed the young archer for his courage. "Eklavya, even with out your thumb, you'll be known as a great archer. I bless you that you will be remembered forever for your loyalty to your guru," Drona declared and left the forests. He was moved and grieved at his own action. But he was content that his promise to Arjuna was not broken. The Gods blessed Eklavya from above. But despite his handicap, Eklavya continued to practice archery. How could he do so? When one is dedicated, one can make even mountains bow. With practice, Eklavya could shoot arrows with his index and middle finger and he became a greater archer than he was ever before. His renown spread far and wide. When Drona came to know this, he blessed the boy silently and begged for divine forgiveness. And true to Drona's blessing, Eklavya is still praised as the most loyal and brave student in the epic of Mahabharatha.